If you are looking for an innovative resource pack for Minecraft, the Counter Craft: Global Mining is the perfect option for you. It has been developed to mimic the addictive gameplay of Counter-Strike: Global Offensive, also known as CSGO. Counter Craft: Global Mining resource pack has been designed to bring an extensive variety of weapons into the gameplay of Minecraft which is really awesome thing. It is surprising to see how well the developers have managed to accomplish this. 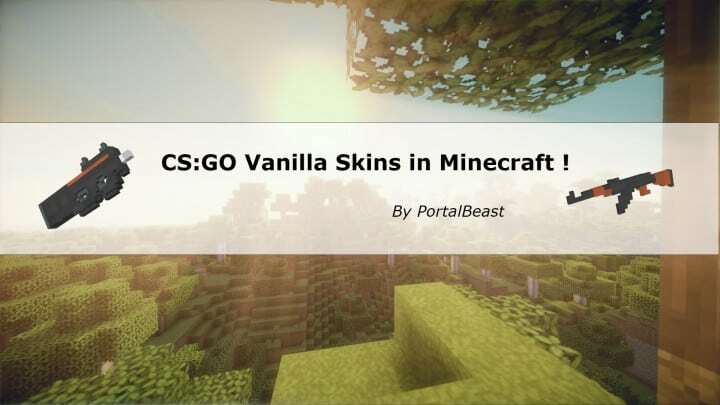 Although this texture pack does not alter the entire appearance and graphics of the CSGO game, but the resource pack brings a comprehensive variety of weaponry into Minecraft. The style and flair of each weapon, in particular, have been imitated to great effect. It is, however, understandable that Minecraft does not have state of the art visuals like CS:GO. Thus, the design of the weapons is relatively less sophisticated and detailed. This limitation does not, however, stop Counter Craft: Global Mining from giving the Minecraft aficionados exactly what they want. The weaponry is enriched with massive detail, thus, enhancing the game in a positive way. As you might know, Counter Strike: Global Offensive boasts a number of custom skins that add class to weapons. Unfortunately, these skins are not featured in the resource pack. You can only access the conventional design of each weapon. Counter Craft: Global Mining is constantly being updated to provide minecrafters with the ultimate gaming experience. As the resource pack hit the market just a few days ago, many weapons are still being updated. The fans of Counter Strike: Global Offensive and Everyone who loves Minecraft and prefer PVP in their play will enjoy Counter Craft Global Mining because with this set of textures they will now be able to use all their favorite guns and artilleries with immense ease. Although this does not convert the game into a battleground, it does imitate the impressive aura of Counter Strike in a very effective manner. Finally, the 32×32 resolution of the resource pack allows users to use it with Minecraft on any computer. Important: The files provided in download are .json files, you will need a resource pack editor such as RPW to implement it into the game. *Credit for creating and developing Counter Craft: Global Mining goes to PortalBeast. It is designed and compatible with the following minecraft versions: 1.11, 1.10, 1.9. Right now Counter Craft: Global Mining has 43078 views.